Since I’m maybe one more post (1 week) from completion of this Sooty Tern, I thought I’d point out a couple local sailors who have, perhaps unknowingly, kept the dream going for me at times when the build became drudgery. On more than one occasion I’ve hit a wall and an email notified me of a new post from either of these guys. A quick read got me realizing I wanted to be where they were doing what they were doing. For those who follow blogs on small boat cruising, these two perhaps are not news. Both sail in my home waters, the Chesapeake. Both have boats of comparable “Sooty” size. And both have a real camera eye and the ability to tell a tale (I’m guessing mostly based on truth). The first is Curt Bowman. His blog is Thin Water Annie. His boat is a wood built Drabscombe Coaster from Maine. Actually, he came by for a visit just last week to peak at my boat’s progress. He’s a very good chap. Curt also paints and is an accomplished artist. Here is a “self portrait” of him with his boat. The second blogger is Steve Early. 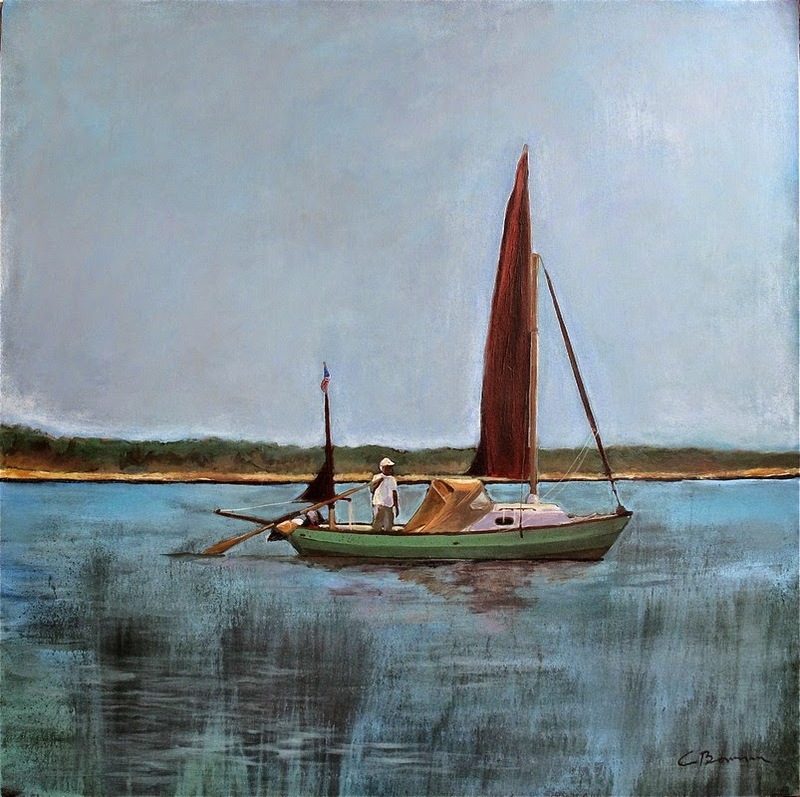 He and his boat “Spartina” spend more time exploring the shores of the Chesapeake and Pamlico Sound than anyone I know. 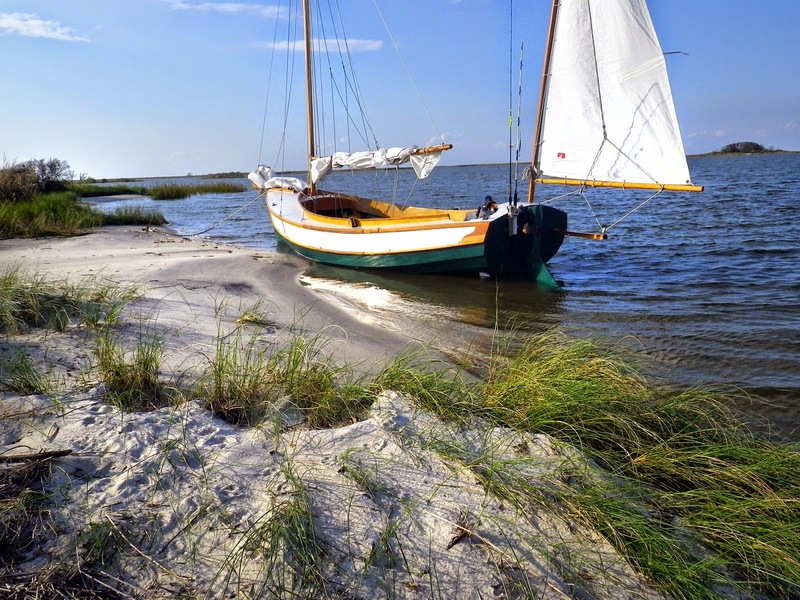 Spartina is a home-built John Welsford design called a Pathfinder. His blog is The Log of Spartina. Steve has a career in photography and his entries are always entertaining and wonderfully pictured. I’ve yet to meet Steve, but I know people who regularly spy Spartina sailing across the waterfront in Norfolk. I’ll catch him one of these days … soon. I truly appreciate the stories these fellows share. Their enjoyment of sailing is a journey and I aspire to have such simple, real, and pure adventures they regularly log. Thank you guys.